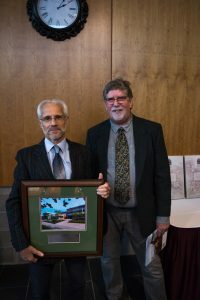 On Friday, September 18th, Dr. Pierre-Yves Daoust was honoured at the University of Prince Edward Island Founders Day with The Honourable Eugene F. Whelan Green Hat Award. The award recognizes those who have made an extraordinary contribution to the Atlantic Veterinary College and we’re thrilled that Pierre-Yves has been recognized in this way. Below is the transcript of the citation that was read by long-time colleague, Dr. Scott McBurney. It is with great pleasure that I read this citation honouring Dr. Pierre-Yves Daoust as the recipient of the Atlantic Veterinary College’s 2018 Honourable Eugene F. Whelan Green Hat Award. Pierre-Yves began his career at AVC in 1987, making him a member of the College’s founding faculty. Since his first day here, he has worked diligently to enhance the reputation of AVC regionally, nationally, and internationally. He was an early adopter and promoter of wildlife health and the concepts of Ecosystem Health and One Health – non-traditional areas of veterinary medicine. Throughout his career, he has shared his knowledge and expertise in morphologic pathology, and his passion for wildlife health and animal welfare, with thousands of veterinary students and graduate students, and with people in Atlantic Canada, across the country including the North, and beyond. 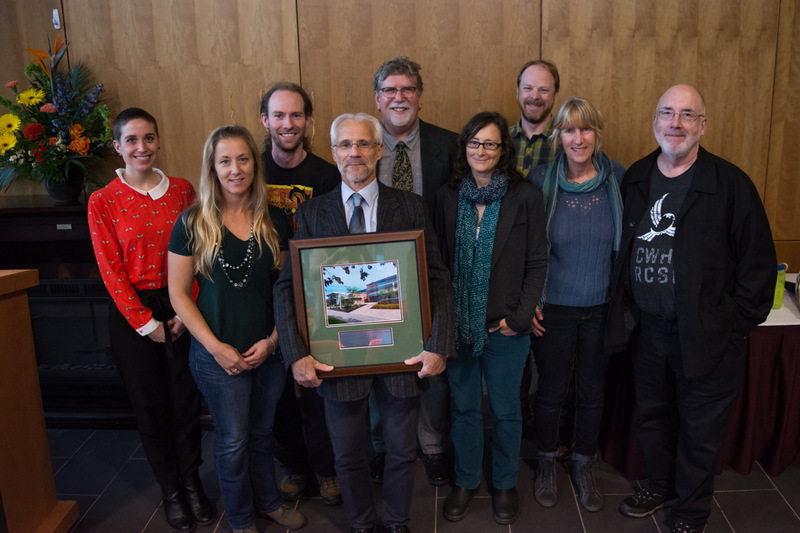 He has inspired the many AVC students who have gone on to become leaders in wildlife health surveillance and management—including several graduates who have returned to the College: Dr. Megan Jones, Dr. Laura Bourque, and Dr. David McRuer. From 1987–1992, he was part of a small group of veterinary faculty in Canada who imagined, planned, and built a nation-wide organization focused on the health of wildlife—the Canadian Wildlife Health Cooperative. Given his contribution to the establishment of the CWHC, it was only fitting that he be named the first regional director of the organization’s Atlantic region node, serving in that role until his retirement in 2017. His leadership as director of the CWHC Atlantic node has positioned AVC as the major centre of wildlife health expertise in the region. It would take far too long to enumerate all of Pierre-Yves’s accomplishments. So I will use these words to describe him: teacher, scientist, leader, visionary. His leadership in wildlife welfare, particularly in connection to marine and fur-bearing animals, has left a major mark on Canada. He has provided national leadership on the application of scientific principles to difficult social issues, such as understanding and improving animal welfare in the harvesting and management of wild animals. Yet with all of these accomplishments, he is a humble man, quick to give recognition to others rather than accept it for himself. His unassuming nature, combined with his rigorous approach to science, has earned him the trust of the scientific community and the general public. He is truly an ambassador for the College and UPEI, embodying professionalism and respect. Over the years, we worked together on numerous wildlife health cases, collaborated on research projects, and taught veterinary and graduate students. I am proud to have Dr. Pierre-Yves Daoust as a colleague, a mentor and a friend. He is most deserving of the Atlantic Veterinary College’s 2018 Honourable Eugene F. Whelan Green Hat Award.